Cut out the patch larger than damaged area and round the corners. If you do not the corners have a tendancy to catch on mattress pad, sheets, and bedding etc. causing the patch to pull loose. Clean the damaged area. Apply adhesive to one side of the patch and on the area where hole is located on the mattress. Wait for a few moments till the glue becomes tacky and hazy colored. At this point immediately place the patch over damaged area and press out air bubbles. Pinholes and punctures can be sealed without patches by applying a drop of adhesive over the damaged area and allowing it to dry however it is best to use a patch. After all is dry apply a bead of glue around the entire parimeter of the patch and let dry completely. This will assure the edges are completely sealed. Finally one side note if your waterbed bladder were to fail, got punctured, or open on a seam somewhere it is important to think ahead before you fill your mattress back up, be sure to purchase a new safety liner. Not sure if you the mattress can be fixed? 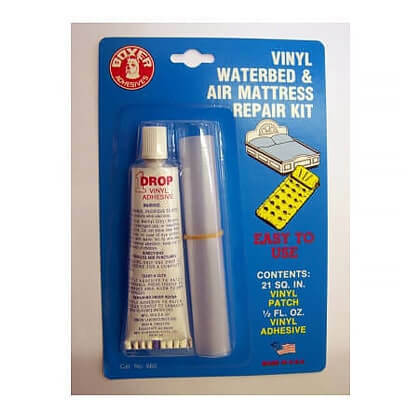 When is it OK to Repair my Waterbed Bladder with a Patch Kit? Is your waterbed mattress beyond repair?